Space is vast, its ever-increasing breadth mindboggling. You never realized just how vast it could be until you and your kind set out among the stars to terraform new worlds and bring life to desolate worlds. You found the perfect system to create and evolve, but just beyond its reaches lies a Great Expanse, with mysteries and riches untold. 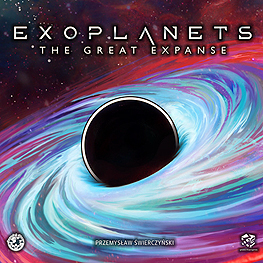 The Great Expanse is an expansion for Exoplanets that brings the wonder and mystery of Gravity, strange Stars, Deep Space - with 16 new Space Tiles - and even bits to add a 5th explorer to your games. Feel free to add any or all of these modules to your travels and expand your horizons! This is an expansion. You sill need Exoplanets to play.